All Plast Brand Rotary Injection Moulding Machine. vertical clamp machines bring you every advantage for insert molding, making it easy to combine two materials and reduce assembly costs. From encapsulation of delicate electronic parts to over molding of plastic on metal for diverse automotive applications, ABS-VV-R also offers a reduction in post-molding operations, saving time and money. All Plast ABS-VV-R machines can be configured for every possible insert molding application by combining a wide range of clamp, table and injection unit configurations. Vertical clamps with horizontal tables let gravity gently and easily do the work of holding single or multiple inserts. Open clamp designs with rotary and shuttle tables give the advantage of working with multiple molds and simultaneous operations including pre-molding, injection and post-molding operation. Simultaneous operations are easily automated for consistent quality, high productivity and high profitability. Led Bulb Injection Moulding Machine. Vertical three column robust clamping and vertical screw type injection. Large Ld ratio for homogenous optimum melt for all type of engineering plastics. Standard Rotary function with 0 deg 180deg clock wise-anti close wise rotational movement. Hydraulic ejector stroke adjustable thru HMI. Ball Valve Rotary Moulding Machine. Available in two & three station mould. Available in PP, UPVC, CPVC, PPR. Three stations rotary table design, effective to increase production capacity and machine safety factor. Vertical clamping and Vertical injection design, especially suitable for the insert molding production. User-friendly LCD display shows various functions with 100 sets of mold memory. Injection and clamping controlled by multiple pressures and speeds ensure easy setting and accurate processing. The P.I.D temperature control is accurate for every section. Dual injection and carriage design provides smooth movement and precision molding. High torque screw motor ensures superior plasticizing ability. Oil-less bushings used on all moving units for better cleanness and easy maintenance. High-rigid frame structure assures stable and smooth sliding movement. 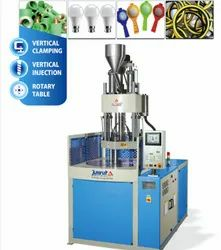 Led Bulb Housing Rotary Table Vertical Injection Moulding Machine. 1. 160 ton clamping force. 3. Hot runner and semi hot runner mould system. 4. Cycle time 24 sec for 8 cavity and 12 cavity. 5. Robot interface, conveyor system. 6. Servo motor pump hydraulic system and servo rotary table. Tea strainer plastic moulding machine. Cycle time 10 to 13 sec for 1,2,3,4 no tea strainer. Max mould size 500 x 500 mm. 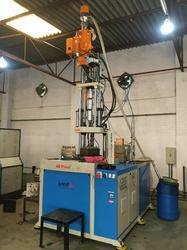 Manufacturer and exporter of "ALL PLAST" brand Vertical injection moulding machine.